Great to be back at the 30th Hay Festival of Literature 2017 in May. 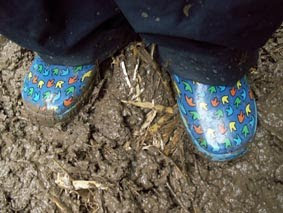 On one of our last outings at the Festival, back in 2008 it rained and rained and rained for the whole duration. 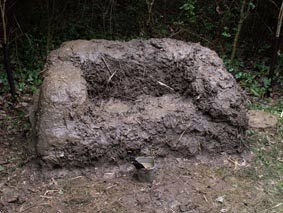 We found ourselves working in a foot of muddy water, the consistency of chocolate smoothie, constructing a mud sofa and arm chair with festival goers young and old. We were delighted to be re-united with quite a few veterans of the 2008 mud bath, including these twin girls who had braved the mire aged just 4 yrs. Here they are then and now! 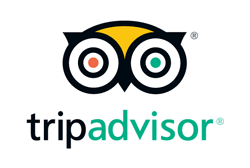 We visited Upton Upon Severn Primary School recently to work with YR3 & YR4. 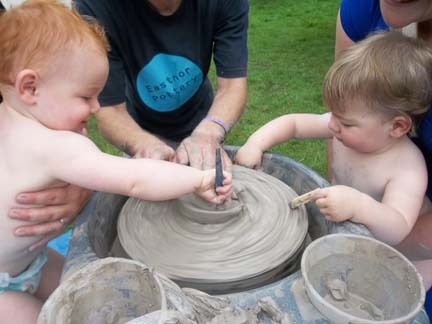 It was such a glorious day we were able to make pinch pot dragons alfresco under a couple of magnificent trees in the forest school area. Despite the coolness of the shade, the June warmth threatened to dry the children’s creations before they’d completed them. But the youngsters knuckled down to the task in hand, working quickly and efficiently to produce awesome imaginary beasts. Well done everybody! Recently spent a magnificent couple of days working with YR1 at Elmbridge Infants School in Gloucester. 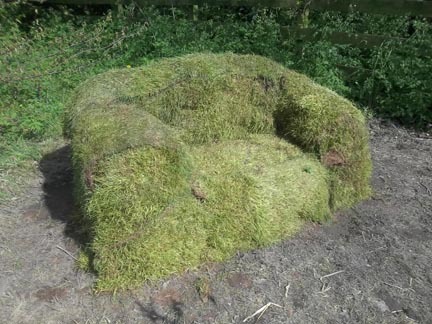 In a bid to enhance the grounds even further, we constructed a turf sofa from clay, earth, sandbags and straw. Very muddy, very messy but great fun. All 72 children contributed 100% as did a band of enthusiastic and willing parents – great stuff! 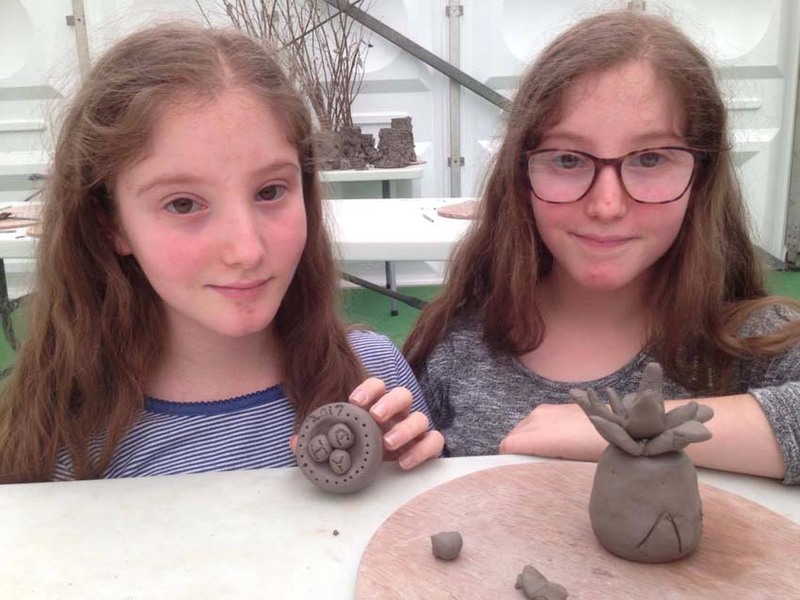 On day two we abandoned the great outdoors and bright sunshine and returned to the shade of the classroom to make collaborative terracotta figures and beasts. Once these have been fired they will be hidden amongst the shrubs and wild areas to extend the children’s storytelling and learning. A couple of years ago I picked up a beautifully designed flyer for a new family festival called ‘Just So’. The illustration was exquisite and I needed to know more. Having just returned from working the festival (now in it’s third year) I’m please to report Just So certainly lived up, neh exceeded the promise and quality of that original flyer. Our contribution, Clay babies and BIG pottery went down very well indeed, with families lapping up the opportunity to get right grubby with the clay and mud sculpture. Well done Sarah & Rowen you have certainly created a magical, imaginative and creative world for little people and their grown-ups. Roll on just so 2013. I spent three lovely days working with the children and staff of Evesham Nursery school in their idyllic forest school site. 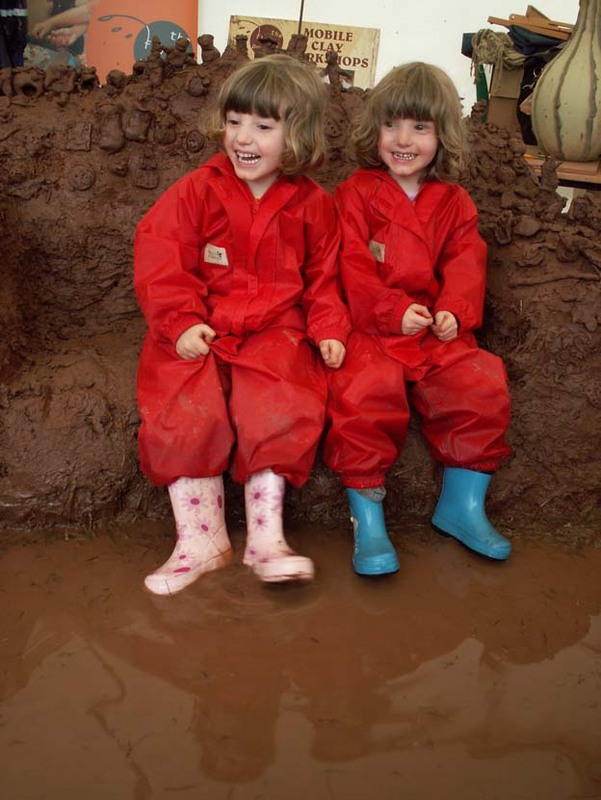 The children helped dig, bag shift, and re-arrange half a tonne of Worcestershire’s finest soil before rendering the structure with a soggy mix of mud, clay, water and straw. Visit our Facebook photo album to see the sofa taking shape.